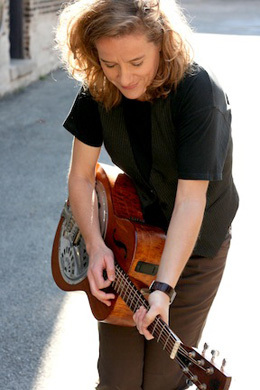 Susan Werner plays and writes an almost impossibly wide range of music, but what ties it all together is her love of language, her passionate intensity, and an unshakable commitment to the stories she tells in song. Michael Feinstein calls her “that rarest of things – a composer who not only adheres to the traditions of the Great American Songbook, but also who adds great new songs to that Songbook with each project she writes. She’s one of the most exciting talents in the country.” “When it comes to crafting a song,” says the website No Depression, her “only peers are Jimmy Webb and Paul Simon.” Susan started in opera, moved to folk, explored jazz and pop, hit classical, gospel, and country rock, and is now going back to her roots with her tenth and latest album, Hayseed, which digs deep into the field of American farming. She grew up on a hog farm in eastern Iowa, earned a Master’s in voice at Temple, and was devoted to opera until she heard Nanci Griffith at a club in Philadelphia. “She was singing – her own songs about her home, Texas,” Susan told the Boston Herald. “I realized it was as noble, as honorable as classical singing. And I thought I could do this!” After recording five albums in the folk vein, she channeled the songwriting spirits of George Gershwin and Cole Porter in I Can’t Be New, an album of originals that aspire to become standards. The Gospel Truth is her foray into “agnostic gospel,” and Classics, recorded with the Boston Symphony Orchestra, offers her classical-pop take on hits like “Mercy Mercy Me” and “Maybe I’m Amazed.” Her 2011 album, Kicking the Beehive, produced in Nashville by Rodney Crowell and featuring guests like Vince Gill and Keb’ Mo’, showcases her country rock side with a little twang and a lot of attitude – “I keep kickin’ the beehive and I know I’ll never learn.” With Hayseed, she comes full circle, taking what she learned on the hog farm and working out from there to scrutinize and celebrate the world of American farmers. Bob Hillman is a witty and engaging singer and songwriter who sings about such things as “Jesus, Blood and Country Music.” Susan Stamburg said on NPR that his Tolstoy song “is enough to make you want to pick up War and Peace and start reading it.” Before you start reading, though, do some listening at the Freight!